Out the back of King’s Cross is a huge new development. While it currently stands fairly empty, there is, in a vast old granary building, Caravan. While not strictly speaking a café, it is often regarded as one of the best places in King’s Cross to get a coffee. That might be because whilst the area is changing, the smaller, independent businesses haven’t quite made it there yet. The coffee here is good. Tangy, tasty and a good size. The beans are roasted in its own small batch roastery and it offers a good selection of drinks along with single-origin filters. At £2.60, it’s a good price for an excellent coffee, though the filters are charged at £3. Despite the excellent coffee, it has been marked down because there was a 70p service charge added to the bill – for two coffees! Yes, it was ‘discretionary’ but your options then are either to pay it or to look like a skinflint and ask them to remove it. With the drinks coming in at £5.60, I’d have been happy to add 40p myself. It’s a big old place, but the atmosphere is not lost like can often happen in old, warehouse buildings. While the focus was on food, we were given a shared to table to drink our coffee, which was fine. 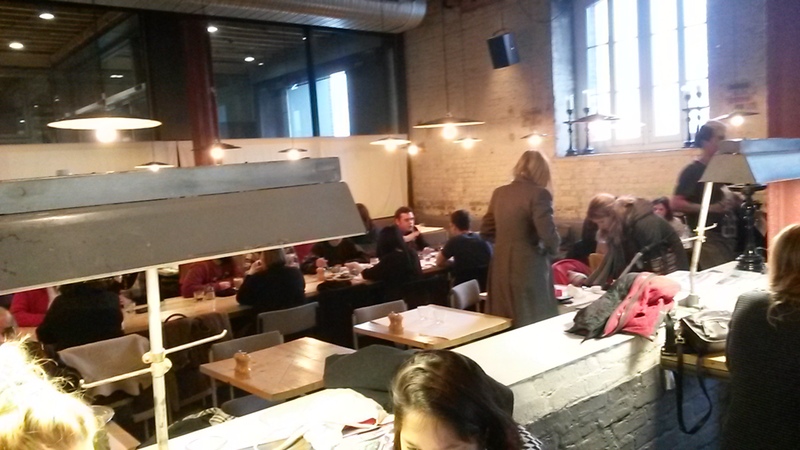 It was packed with mainly students from the adjoining university and a few workers from around King’s Cross. Although it is close to the university and had Wifi, it didn’t feel like the kind of place you’d go to work alone. It’s more of a post-work venue for a few friends. 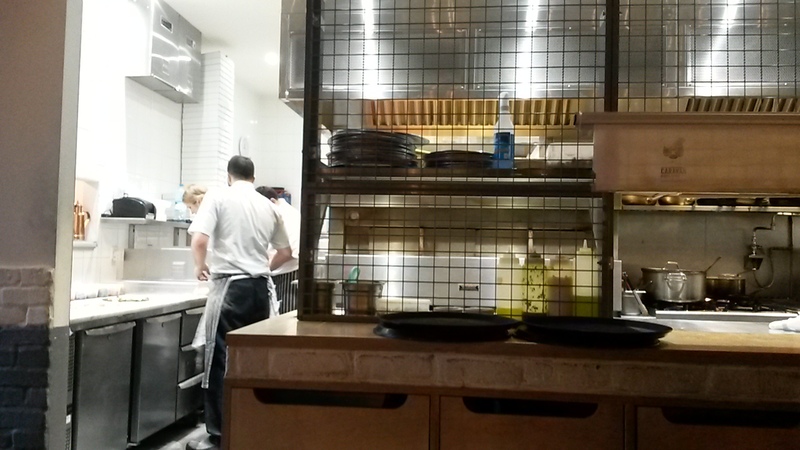 The open kitchen added to the bustling atmosphere. While we didn’t try any, the food looked excellent and the menu interesting. Fresh made pizzas from £7, various breads and cheese and other smaller plates and a handful or larger main courses including Wagu rib-eye steak for a very reasonable £15.50. 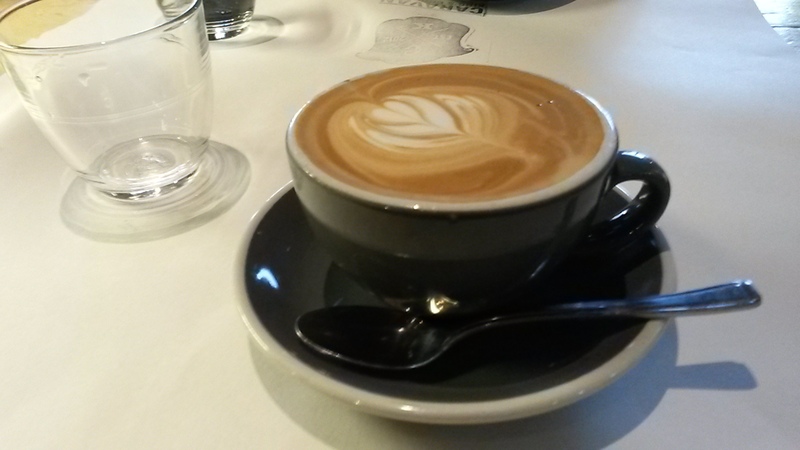 While the service wasn’t bad, I did feel that, as a coffee drinker and not a diner, I was a bit in the way. We were asked twice on arrival if we would be eating and given a high chair sharing table instead of one of the more comfy looking lower tables. It also took us a few moments to get the bill as the staff seemed keener on chatting among themselves or tasting the food than serving people. Also, there’s the issue of the ‘discretionary’ service charge as I mentioned above. Though we did get a carafe of water on arrival which was a very nice touch. 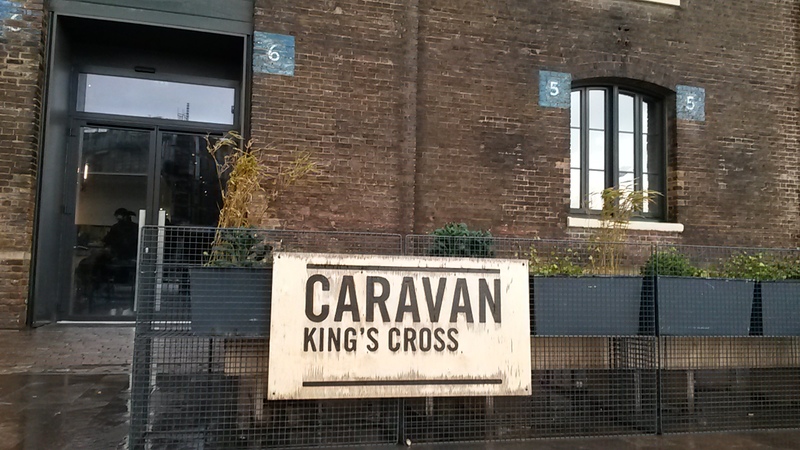 Apart from the carafe of water, Caravan was a functional, stripped down venue, with no additional extras. However, a quick search on their website shows that they do have Coffee Workshops in their roastery. While this is well reviewed elsewhere as one of the best ‘cafes’ in the area and does serve a good cup of coffee, don’t go expecting a café. It’s a restaurant that serves good coffee and I think their attitude to coffee drinkers reflects this.